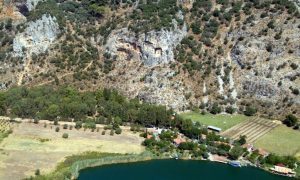 History Dalyan General Information - Dalyan - Travellers guide - Hotels, Real Estate, Shopping, Caretta Turtles, Dalyan Beach, Dalyan Delta and more..
Kaunos is one of the most mysterious cities in the Mediterranean region. 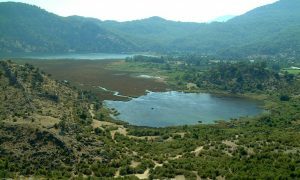 It’s situated among Marmaris, Köyceğiz and Sarıgerme. The waters of Köyceyiz lake fall into the Mediterranean Sea by a natural canal. The canal, which is approximately fifteen metres in width, seperates Kaunos from Dalyan. On a steep slope just opposite the town of Dalyan, sizeable rock tombs which belong to the people of Kaunos are seen. 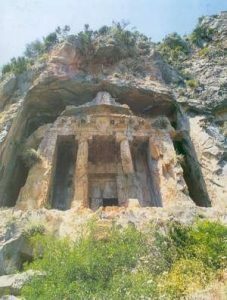 These rock tombs are the landmark of Kaunos and Dalyan. Kaunos ruins are one kilometre away from Dalyan. It’s possible to reach Kaunos by motorway or by sea. Daily excursions from Marmaris to Kaunos and to Dalyan are organized everyday. However, because of the shallowness of the water at some points where the waters of the canal fall into the Mediterranean, yachts are not allowed to enter Kaunos. Passengers are carried from here to Kaunos by small boats. Kaunos ruins are one kilometre inside from the canals. That’s why, after disembarking from the boat, visitors are required to walk for ten minutes to get to Kaunos. As the stabilized road has a slope, it is necessary to walk up the hill. The city ramparts are partly in good condition. These ramparts indicate that you have arrived at the antique city. After the city walls you can come across a shop where visitors meet their needs and the guard stays there. At this point there is a label with a schematic drawing suggesting the visitor how Kaunos can be toured. While touring Kaunos different routes are followed at the entrance and the exit. The exit is at Dalyan side and there are boats waiting at this part. Besides there is a toilet, a shop for some needs and a cafetaria. After archeological excavations it’s been understood that the history of Kaunos dates back to 3000 BC. Kaunos was one of the Greek colony cities in the region of Karya. Throughout the history, Kaunos witnessed Persian, Hellenic, Roman and Byzantium civilizations. After the XIV th century, Kaunos came under the sovereignity of the Menteshogullari State and the Ottoman Empire. Since its foundation, Kaunos has been famous for salt, saline fish and figs. The brightest period of Kaunos was between the 5th century BC and the 2nd century AD. Since Kaunos witnessed plenty of civilizations, various constructions techniques can be seen in the city. Judging from the city ramparts, it’s clear that the city had a very large area. In his work the famous historian Heredotos wrote that the people of Kaunos spoke the same language as the people of Karya, that they came from the island of Crete and that they followed their own traditions. So, the people of Kaunos are seperated from the people of Karya and Likya. A geographer from Amasya, Strabon, who lived in the Roman period, mentioned some interesting observations in his book. In his book the author wrote that Kaunos was a fertile city. However, since the summer and autumn seasons were very hot, he wrote, the weather was considered not to be good. The reason why it was considered so, as he pointed out in accordance with the belief of that time, was ‘the abundance of fruit’. According to the author, ‘the people of Kaunos are pitifully unhealthy and the duration of their lives is as short as leaves’. The fact that Kaunos, about which a detailed information is available, was attracted by historians and geographers proves the importance of the city. The foundation of Kaunos is to do with the mythological tales. The best known myth about the foundation of Kaunos was translated by Azra Erhat from the famous Latin poet, Ovidius. Miletos brings twins to the world, a son and a daughter. The son is named Caunos (Kaunos), the daughter is Byblis. According to a rumour, when the children have grown up, Byblis falls in love with Caunos. Byblis’ love for Caunos grows everyday. So, she decides to write a letter in which she expresses her love to Caunos. But what Caunos feels in return for her love is just hatred, anger and loathe. Because of this unnatural love, Caunos decides to leave for Karya with his followers, and then he sets up a city which will be called after his name. Becaused of her unreturned love, Byblis wants to commit suicide and she jumps of a high rock. Nymphs take pity on her and turns her to a spring. Byblis’ tears become a river and flows. That’s the sad foundation story of Kaunos. The end of the city is also sorrowful. First the harbour overflows, then we see mosquitos which cause a deadly disease and finally frequent earthquakes. Just like penalties for the city to destroy it. The antique city is situated on an uneven plot. The principal monuments of the city are; Acropol(the fortress and the ramparts), city ramparts, theatre, church, bath, fountain, stoa, agora, storehouses, inner city roads, temples, sacred area, harbour and cemetry. Apart from these, such structures, which are not available at present, as a military harbour, a dockyard, sports facilities, houses, monuments under the earth etc., show that this antique was a very important settlement. Kaunos can be considered to be a state and neighbouring Pisilis (Sarıgerme), Sultaniye (Köyceğiz Lake) are subordinate settlements.